Conspiracy Nutjobs Crazy or Not? Those crazy conspiracy nutjobs with their tinfoil hats and wacky haircuts always crack me up, but I just can’t stop myself from listening. The entertainment value alone is worth your time, and advertisers know it. Just ask Alex Jones. His company pulls in millions every year in advertising revenue and product sales. All that being said is there really any other reason to listen and read for anything other than pure entertainment? I'd say “yes” there is. If you can somehow filter out the fake from the real there is quite a lot useful information that you can pick up and use. Fluoridated Water- Helps fight cavities. Lizard Men - Yeah they are not real. 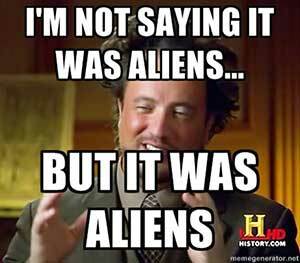 Aliens - I beleive in aliens, but why are they only abducting middle aged, toothless, shirtless hillbilies named Cletus? We may never know. Sales Pitches - Problems are often fabricated in an effort to sell products. If you can somehow filter out that wacky stuff and focus in on the more plausible stories there is some worthwhile stuff to be learned. I think the problem is that people in general would rather be entertained by the likes of Kim Kardashian and Miley Cyrus, and in order to compete with Kim’s rather voluptuous posterior many agencies promote bogus ideas. What do you think? Please post in the comment section below.